Shop Apparel Zoo, online at apparelzoo.com, for the freshest trends in urban apparel. Apparel Zoo offers a diverse collection of clothing and accessories for men and women, including jeans, outerwear, hats, watches, sneakers, jerseys, buttondowns, swimwear, boots, sunglasses, and much more. Apparel Zoo has Akademiks, Dissizit, Adidas, Alpinestars, Apple Bottoms, Levis, Radii, New Era, Dereon, Free People, Pro Keds, and many more. So check out all the latest looks at Apparel Zoo. But before you shop, get all the latest apparelzoo.com discounts, Apparel Zoo promotions, and Apparel Zoo coupon codes found here at RetailSteal.com. 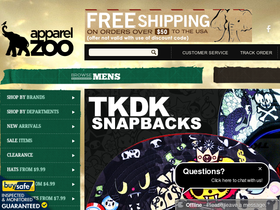 Apparel Zoo ships within the United States and internationally. Apparel Zoo ships via FedEx and USPS, and offers free U.S. shipping on purchases over $50. See site for more information. Save up to 70% on apparel and accessories on sale at Apparel Zoo. Click link to save on Pro Keds, Young & Reckless, New Era, and more. Take 20% off everything from Apparel Zoo. Use this coupon code to save on top brands, like Free People, Mitchell and Ness, Dereon, and many more. Shop at Apparelzoo.com and save 25% on your entire purchase with promo code. Click to shop for the hottest brands. Use our coupon code online at Apparel Zoo today to save 15% on all merchandise. Don't miss out on this great discount. Enjoy free shipping on your purchase from Apparel Zoo. Click here to shop Akademiks, Dereon, New Era, and more. Enjoy discount on purchases $50+. Enjoy a 10% discount on purchases from Apparel Zoo online when you enter our coupon code at checkout today. Click our link to shop.